The tech industry is booming and it has created thousands of work from home jobs that different types of people, including felons, can take advantage of. Because there is no formal interview process or a background check for most online jobs, this is an ideal niche for a felon with the right skills to earn some extra cash. 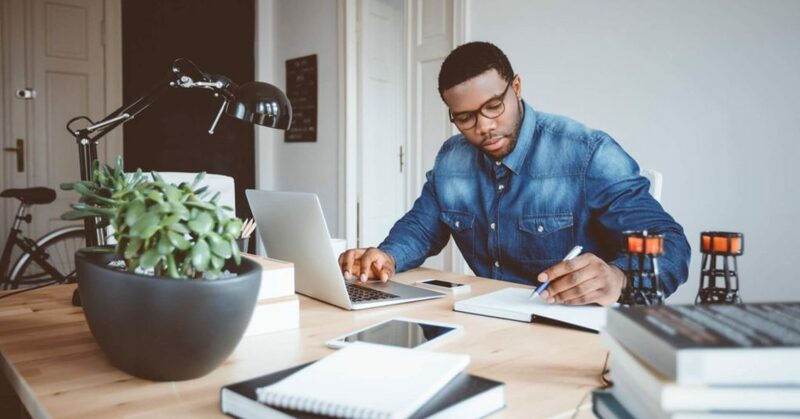 As of 2019, over 43% of adult Americans are involved in some type of remote online job – so now is the perfect time to get into this booming field! While there are many scams out there that promise thousands of dollars a week for doing pretty much nothing, there are also real, legitimate full and part time jobs that you can do from the comfort of your home. 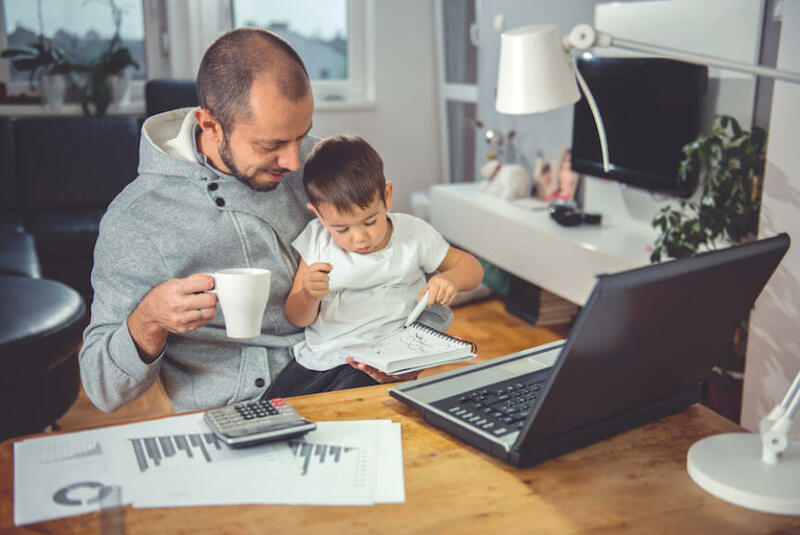 Lets take a look at some of the most popular work from home careers, and how someone with a criminal record can get into this line of work. Note: in this post we are focusing on remote jobs that require minimal skills, low level of education and prior work experience. People with felony convictions would have a much higher chance of getting one of these jobs, compared to more advanced careers. Salary data for the jobs listed below has been sourced from Glassdoor. Entering data is a very lucrative online job. There are lots of positions available, and you don’t really need any skills, besides being able to type quickly and without mistakes. While this may seem like a boring and monotonous job, its a great way to earn extra cash on a regular basis. Salary: average range is $9-11 per hour. Most companies run some type of a blog to attract new clients, gain visibility online, etc. To do this, they need someone to produce fresh content related to their products or services. So if you have good writing skills and have a passion for something: food, travel, home improvement, beauty, cars, etc. you can work as a blogger and produce content for different websites. Some bloggers are asked to write for the same company or website regularly, others get one-time content orders from different companies. If you want to get into this field, you will need to show samples of your copywriting work. It may also be a good idea to start out writing some free content in order to gain exposure and experience. Note, US based companies prefer to hire bloggers with Native English speaking and writing skills. Salary: most writers get $40-100 for a fairly short article (under 1,000 words) and $80-150 for longer pieces (1,500-2,000). How much you get paid, also depends on your experience and reputation. Some well established bloggers easily charge $200-300+ for one article. There is a trend for US companies to go global in their marketing outreach. As a result, many are translating their original content, which is written in English to other languages. Most popular languages are Spanish, Chinese, French, Hindi, Bahasa Indonesia. They look for people who are native speakers of one or more of these languages as well as English to translate their content. Often, this can be an ongoing assignment: many companies are publishing their blogs in more than one language simultaneously. Higher paying translation jobs require some expertise in a particular field: legal, medical, financial, sciences, etc. Salary: depending on the length of the article or video, you may get paid $30-60 for one translation. Transcription is a very popular online job that does not require much skills. Businesses in various fields hire freelancers to transcribe video or audio files. Your job would be to listen to what is being said, and write it down word for word. Patience, fast typing and good hearing are all that’s really needed to do well. If a transcription subject is very niche or technical, you may need prior knowledge in the field (these also pay more). However, there are plenty of general transcription jobs out there. Being bilingual can help you get more of these jobs as well as higher pay. Many companies many need someone to transcribe from English to another language, and vise versa. Salary: entry level pay starts at $10-12 per hour. More experienced transcribers with advanced knowledge of a specific field may earn up to $25 per hour. Becoming a virtual assistant (VA) is probably one of the easiest types of jobs you can do remotely, because it doesn’t require any complex skills. Small to large size companies hire VAs to manage their daily tasks, but it may be a lot easier to work for a small company if you are just starting out. If you don’t think you have the skills to be hired as a virtual assistant, there are inexpensive online classes that will provide you with basic training for this job. They typically cost $200-350 and you can graduate in a few weeks. Salary: an entry level virtual assistant can make $15-20 per hour. Someone with experience can easily earn $30-50 per hour, especially if they are hired by a large firm. To stay competitive, most businesses (physical and virtual) use social media websites such as Facebook, YouTube, Twitter, Instagram, Tik Tok, Pinterest, Tumblr, Reddit, LinkedIn, Snapchat, etc to advertise products and services, conduct polls, and increase brand awareness. They look for professional social media content managers to produce and manage their content remotely. If you naturally love spending time of these platforms and know how to navigate their features, this may be a great way to make money online. Salary: as a contractor/freelancer you can make $14-17 per hour. However, if you land a full time job, your pay can be as high as $25-30 per hour. Many companies have done away with large call centers because they are too expensive. Instead, they hire people to answer the phone remotely, from the comfort of their own homes. Indeed, customer service has the biggest slice of the pie in work-at-home jobs. Most businesses prefer to hire native English speakers as well as people who are bilingual. If you like dealing with people and are into resolving conflicts, this may be a perfect job for you. Companies provide training for their customer service representatives and teach them how to answer questions, troubleshoot a product or service, deal with problems, etc. Taking surveys online is an extremely popular and fast way to earn a quick buck. Companies want to test and improve their products and services so they need feedback from real users, like yourself. Taking a survey is something you can do on the go, from your phone; an average survey takes 1-5 minutes to complete. Some surveys are more elaborate and can take 20-30 minutes – these also pay more. While taking online surveys will not turn into a full time job, because each survey pays fairly little, you can earn a decent supplemental income this way. Many people report making $100-200 taking surveys online. Also, answering questions about a product or service is very easy and often fun! When you sign up to take surveys, you will be contacted to participate when a survey that matches your demographic data comes up. A word of caution: this field of online jobs is full of scams!!! There are many sites that advertise taking online surveys for high pay that ask for your social security number, bank account and other financial information. Don’t sign up with them, as they will steak and misuse your private information. Also, legitimate survey sites will make payment information very clear and will not charge you any sign up fees. Salary: $1-50 per survey. The money is deposited immediately into your PayPal account upon completion of the survey. Another form of payment is points, which can be redeemed for products or services. You can sign up to take as many surveys as you like. If you have expertise in a particular subject area: math, English, writing, history, biology, etc, you can work from home as an online tutor. Many kids need help with homework, test prep, writing college essays, SATs and other types of exams, and their parents are willing to hire remote tutors for them. Also, many students overseas in countries like China are looking for good tutors to help them study for entry exams to get into US private schools and colleges. You can look for online tutoring jobs on websites such as: TutorOcean, TutorMe, QKids, Brainfuse. Many online tutoring websites require at least a bachelor degree in a subject area you want to teach. However, the good news is that you don’t need any prior teaching experience to become a tutor. Salary: remote tutors earn $10-20 per hour to start, in most subject areas. However, experienced tutors with high ratings can earn $50 per hour or more. There are dozens of online freelance sites that list legitimate remote work opportunities. However, the most popular platforms with the largest number of different job postings are Upwork, Guru and Freelancer. To take online surveys, apply to: Survey Junkie, Swagbucks, DarwinsData, PineconeResearch and PaidViewpoint. The beauty of all these websites is that their services are completely FREE – it doesn’t cost anything to join and to start looking for a job, or to contact potential employers. The first thing you need to do is create a profile on one or more of these sites. Be sure to list all your skills, relevant education and work experience. If you have any samples of work (coding, writing, graphic design, ad copy, etc) be sure to post it as well. Once you have a profile, employers will be able to find you and contact you if your skills match a job opening they have. However, you shouldn’t sit and wait around for an opportunity to come knocking on your door. Instead, you can search these sites for relevant job postings and apply yourself. Don’t be discouraged if you don’t get hired right away. Sometimes it takes a few months to get your first assignment. However, once you are on a roll and you get consistently good reviews for the work you have done, you will see new offers rolling in. Many people start out freelancing part time, just to earn some supplemental income, and then transform it into a full time career that brings in at least a 5 figure salary. – Excellent pay: at least 2x as much as a minimum wage job. Many freelancers earn as much as $35-45k if they work full time. Because work from home jobs is such an attractive industry, many scammers make up fake websites that take advantage of people looking for remote work. Many of these fake ads and 1-800 phone numbers can actually be found on legit social media sites and career search engines. One way to know that an ad for online work is a scam is how much money it promises you will make. $1000/day or $250,000 a month, or something similar sounds extremely desirable. However, they are just not true! Realistically, someone working a low skills remote job from home full time can make on average $1,500-2,500. High-tech, medical, finance and law professionals working remotely can make more: in the ballpark of $5,500-8,000 a month. However, anything higher than these salaries is extremely rare and is more likely fraud. Other signs of a scam are websites that ask for sign up fees, monthly fees, and private information such as social security number, date of birth, bank info, etc.